The most rugged, gasoline-powered, hot water, on-site cleaning machine on wheels. 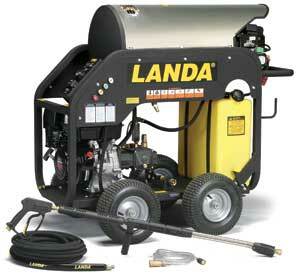 Self-Contained, Gasoline-Powered, Diesel-Heated, Hot Water Pressure Washer. Industrial-duty Honda or Subaru Robin Engine, with overhead valves and easy-access oil drain line, is mounted on Vibration Isolators for less wear and longer life.